Simon Wormull has been named first team head coach at Burgess Hill Town. Wormull, along with John Rattle, has been caretaker boss after Ian Chapman first took a short absence of leave before chairman Kevin Newell accepted his resignation. 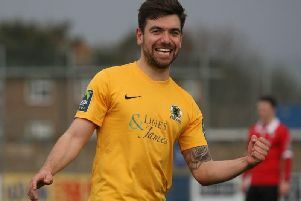 The former Brighton, Crawley Town, Leewes and Eastbourne Borough player was brought in as as a coach by Chapman after Stuart Tuck left the club. Rattle will be Wormull's number two. Earlier in the week, club chairman Kevin Newell said: "Newell said: “I’ve had 12 applications from some very impressive and experienced managers and with respect to them I want to read them all before I make a final decision and I’ve told them all a decision will be made on Friday. SEE ALSO Burgess Hill Town chairman 'impressed' with quality of manager applicants as decision looms | Burgess Hill Town chairman accepts Ian Chapman's resignation | Have Burgess Hill Town finally found their way at Bostik Premier level?